Today we rescue from the good news section of World Headlines the story of a chimpanzee called Wounda. A story full of life and optimism at a gloomy and often discouraging time when the news are often written in the darkest shades of gray. You may even be up to the task of asking Rebeca herself about the story as was done a few years ago by the team of Entrepontes, one of Prensa-Escuela’s blogs. 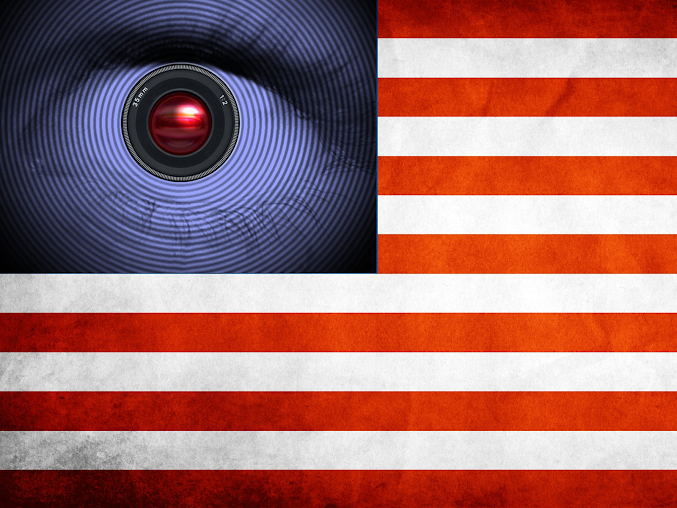 Newsmedia around the world have underlined this past week the limitless reach of the NSA, the American National Security Agency. Global surveillance by the US government opens a line of debate about privacy and internet security that can be very fertile in classrooms all around the world. 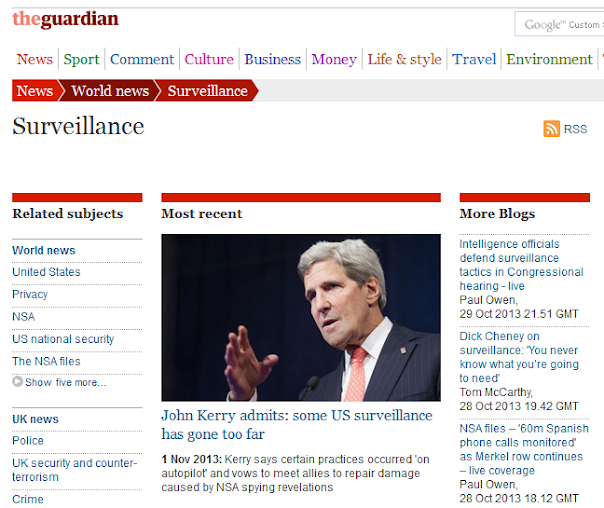 Millions of Spanish, German or French people, among many others all around the globe, have been spied on, making Orwell’s a self-fulfilling profecy that curiously hasn’t massively led people to the streets or countries to severely warn the US to stop surveilling anyone in the name of “National Security”. Why? 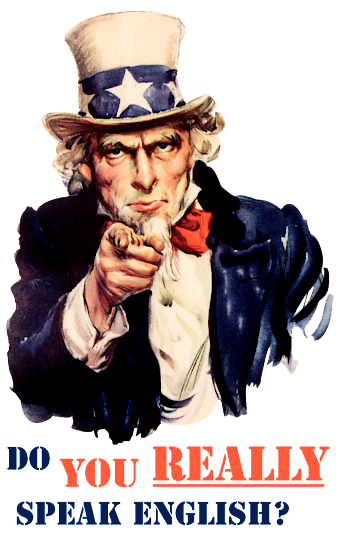 Take the results of the debate, post them in your blogs and, maybe, they will end up being spied on by the American global Thought Police. The last time something similar happened (September 11, 2001) consequences shook and changed the world into a continuous state of global alarm. The message was and still is: “wherever you are, you are not safe”. 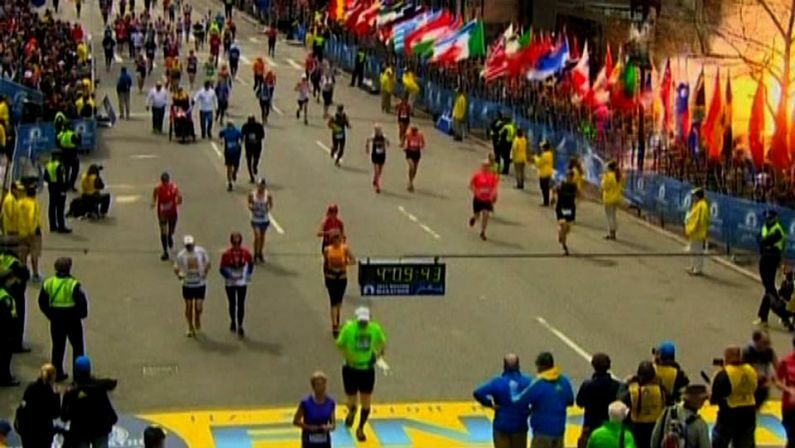 And this is especially meaningful when it happens in Boston, the birthplace of the republic, during a National Holiday, Patriots´ Day, held every year the third Monday in April to commemorate the battles of Lexington and Concord in 1775, the first combats of the American Revolutionary War. This is why today we propose a research project for either your advanced English class or your bilingual History class. You can take advantage of the resources Newseum provides you by offering you access to the pdf version of the frontpage of most US newspapers, updated everyday. This site also has a hidden jewel, an “archive of national and international front pages that chronicle events of historical significance”, dating back to 2001, with news of the 9/11 attacks. With these tools as a starting point, the students can search all sorts of information from the media in order to look for the causes and effects of previous terrorist attacks either in the USA or anywhere else in the world. World Headlines takes us today to one of the favorite and recurrent topics in Spanish media: Why is it so difficult for us to master the English language? This headline, from El Huffington Post, not only exemplifies the frustration through a chronicle of 25 year old Ruth, who places herself in an intermediate level quite insufficient for the job opportunity she sees slipping through her fingers. Like most of her fellow citizens, she declares to understand “parts of texts, talk about simple issues and understand conversations that are not very complex”. That is, she will probably be able to pass a written exam on a few lessons of a textbook with standard topics such as “the school”, “the airport” or “the restaurant”. An exam that will be restricted to that vocabulary and to the grammar issues that she has been dealing with for the 18 years she has been taken an English class for three hours a week. Dubbing movies and television shows, seeing the language as another school subject we just need to pass and then forget, or the very Spanish fear of “making fools of ourselves” are frequently mentioned as some of the causes why only 10% of Spaniards consider themselves proficient in English. What is wrong with the way we study English? What can we do to really and finally improve our proficiency? Writing the answers in the blog and using this tool as one of the possible solutions can be the first step towards achiving that dream. 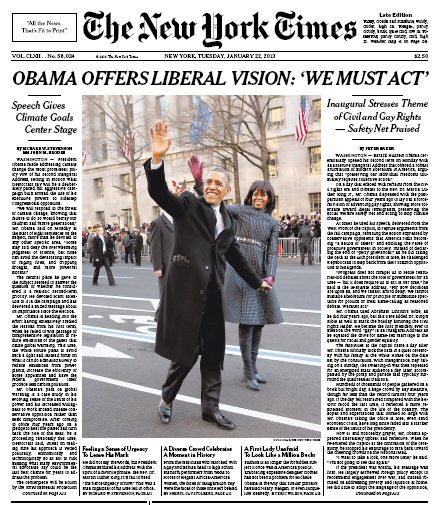 Barack Obama’s second inauguration as president of the United States made it to the frontpages all around the world. This ceremony, that takes place on the 20th day of January every four years, has somehow been different this time. And finding those differences are the challenge we propose today. In the first place, students can compare headlines, videos or pictures from four years ago and come out with a list of similitudes and differences between that Obama as the first black president of the United States and this more experienced Obama in his final term. On the other hand, they can use the selection of frontpages offered below or any other internet tools such as Newseum or Kiosko.net in order to compare the impact this event has had around the world. What happened to the first term Obama empowered by the votes of millions of his fellow citizens and by the “Yes We Can” mantra he used to get to the White House? What has happened to the world in the past four years? Has Obama been successful in making the world a better place for all of us? What are the challenges ahead for him, for the United States and for the rest of the world? Research, debate and posts in the blog with the results of these activities or any other teachers and/or students can come up with are an open window to world affairs, a fertile field to share ideas and develop well informed critical thinking. Enjoy the ride! A quick review of local headlines that you can find in the Newseum website can give a closer and more vivid account of the facts, including direct testimony of the victims and their families: “We don’t know how we’re going to get through this” are the words of a neighbor of Newtown, heading in large white typeset four out of five columns of The Hour, one of the main local newspapers in Fairfield County. 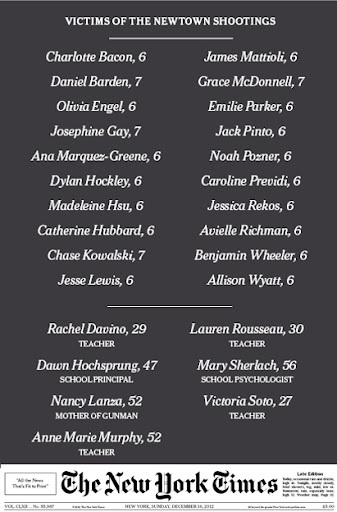 This feeling of perplexity is summed up in the full page headline of The News-Times: “Newtown asks why”. And this can be a good starting point for a critical analysis of what happened in a peaceful rural American town where only one person had been murdered in the previous ten years, but in a country with almost 300 million weapons in the hands of civilians and close to 10,000 annual firearm homicides, according to gunpolicy.org. Finally, we can profit from the quick updating speed of such helpful resources as the Wikipedia, where you can find, under the title “Sandy Hook Elementary School shooting“, a good summary of the tragic Newtown events as well as an extensive list of references where to complete the information. La prensa internacional es un espacio ideal para navegar en busca de noticias que complementen no sólo las clases y proyectos de lengua extranjera, sino también un lugar propicio para el enfoque de aprendizaje integrado de las lenguas y para trabajar temas que pueden tocar una o varias disciplinas del currículo escolar. A través de esta ventana se puede ampliar el horizonte que a veces queda restringido al huerto de la casa propia y que sin duda se beneficiará y enriquecerá con noticias que provengan de lugares situados más alla de nuestras fronteras lingüísticas y políticas. Este nuevo espacio del Blogmaestro situará su ventana al exterior en la barra lateral derecha y se abrirá una vez al mes a lo que la prensa online traiga a este lugar de encuentro. Y lo hará preferentemente en una o varias lenguas extranjeras. Por eso, para navegar con éxito estas aguas proponemos los navíos lingüísticos de cada cual o, si no se tiene acceso a ellos, los flotadores que tanto los navegadores como diversas páginas web y herramientas como Babylon ofrecen para traducir de forma instantánea y un tanto imprecisa, aunque suficiente, los textos de esta pequeña Babilonia bloguera. Y para inaugurar esta sección, se ofrece a continuación un viaje alrededor del mundo en busca de noticias sobre las elecciones gallegas y sobre la visión que otros países tienen a través de la prensa de lo que pasa en nuestra pequeña esquina suroccidental de Europa. 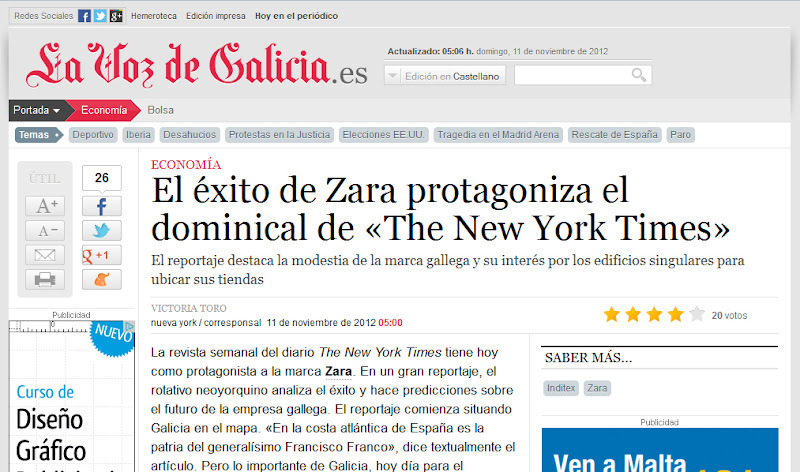 The first thing one finds after writing “Galicia” in the search box of any newspaper around the globe is that this area is also known as “Galice”, “Galicien”, “Galicie”, “Галісія”, “Γαλικία” or منطقة غاليسيا . We might also find news about a region in South East Poland and Western Ukraine named Galicja in Polish and Галичина in Ukranian, but not news about “regional elections” as they are referred to in most English speaking countries and newspapers. But that was not the case this week. These elections were given plenty of spaci in both print and online versions of newspapers around the world. A good place to start is a well known reference from across the Atlantic: The New York Times. The headline explicitly addresses the effect on Rajoy’s prensent and future policies: “Voting Favors Spain’s Leader in Home Area“. That is, these elections have been quite a breather for a Prime Minister walking on thin ice. The first paragraph emphasizes the main idea: “Spain’s governing Popular Party retained control of Galicia, Prime Minister Mariano Rajoy’s home region, on Sunday in an election that was seen as a significant bellwether for Mr. Rajoy’s program of tax increases and other austerity measures”. Although the piece moves on to the “separatist drive” “in the neighboring (sic) Basque region”, the last two paragraphs go back to the Prime Minister who, under the pressure of “Spain’s European partners”, “has ordered Spain’s regions to tighten their finances”. The closing lines are for the words of socialist Xaquín Fernández Leiceaga, who foresees a bright future for Galicia’s reelected president: “Feijóo is somebody to watch for the coming years”. The perspective in one of the main German newspapers, Frankfurter Allgemeine Zeitung, shifts to a religious expression in order to underline the Galician “miracle”: “Gelobt sei Galizien” (God bless Galicia). 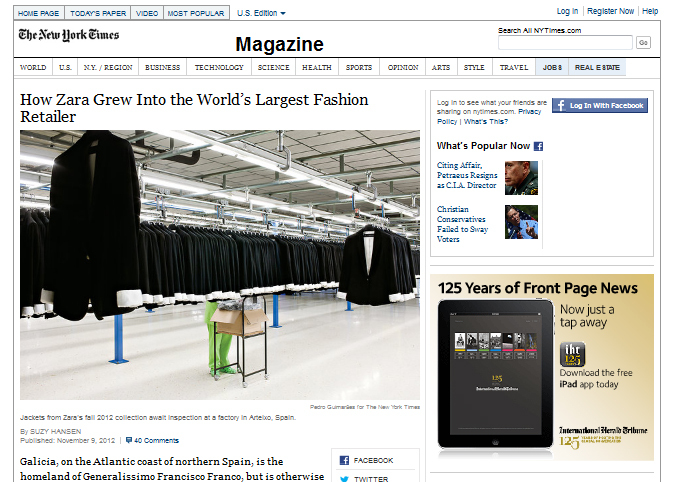 followed by an article focused on Mariano Rajoy’s economical and political challenges. None of the newspapers show images of the Galician polls. Most of them use pictures of Mariano Rajoy. 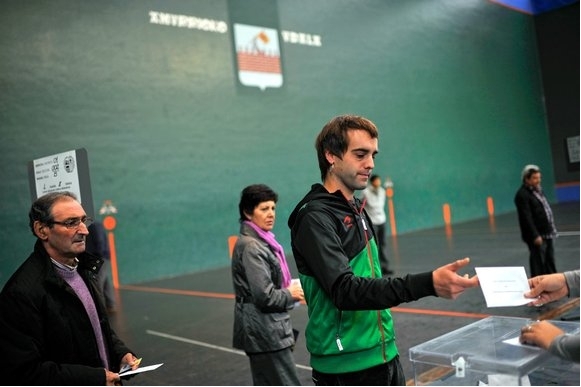 This one from the elections in the Basque Country is from Le Monde. Those challenges are clear in The Sunday Times pre-election headline (“Spanish separatist regions to go polls“) and in the one offered by Le Monde (“Les nationalistes plébiscités au Pays basque espagnol” – Nationalists acclaimed in the Spanish Basque Country). Both underscore the nationalist twist of both elections, but the French newspaper barely mentions the polls in Galicia, paying much more attention to the neighboring “Pays basque espagnol”. Finally, we fly to the faraway lands of China and Australia. In the first case, the China Daily agrees with the interpretarion of both The New York Times and the Frankfurter Allgemeine Zeitung: “Spain’s PM gets boost in regional votes“. But this “boost” decreases in the most balanced headline of them all (“Mixed election results for Spain’s PM“) offered by The Australian. As you can see, the internet has achieved something a few years ago was completely unthinkable: “regional elections” in Spain are in the headlines all over the world. Thirty years ago, when I first visited the USA and France, Spain was only in the news in some brief piece a couple times a year. For more than ten years I never read a piece about Galicia except for a report on the way to Santiago in the Travel section of The Boston Globe. Thus this section will bring the Prensa-Escuela community a selection and an analysis of world headlines and global news that might be useful in your daily work in the classrooms.